In 1917 Allied Merchant ship losses reached the staggering total of nearly four million tons. Many of the U-boats preying on shipping in the Channel and Western Approaches came from the main U-boat base, at Bruges. Rear-Admiral Roger Keyes devised a plan to immobilise this base by blocking it's access to the sea. This was the famous attack on Zeebrugge, on St. George's Day, 1918. The success of the operation rested on the destruction of a lone, metal viaduct connecting the mole, which housed the harbour defences, with the shore. If this could be destroyed then no re-inforcements could get to the mole and the defences could be put out of action by the assault troops. It was decided that an old submarine, with it's front end filled with explosive, would be driven in amongst the support girders of the viaduct and then detonated In fact two old submarines, C-1 and C-3, were made available but it was C-3 (Lt Richard Douglas Sandford RN) which successfully completed the mission. Under cover of smoke and darkness Sandford made his approach to the viaduct, but the wind changed suddenly leaving him with a mile and a half to run under full view of the German guns. However, C-3 made an unhindered approach with a great battle in full swing half a mile away on the mole, shedding an eery [sic] light over the whole area. Sandford made straight for the centre of the mole and ordered his crew on to the casing. It transpired that the Germans thought C-3 was trying to enter the harbour and were quite happy to lure her an to the viaduct and certain capture. C-3's bow hit the viaduct and ploughed through the girders, coming to rest with her bows exactly in the right position. Sandford then ordered his crew to lower the skiff, provided for their escape, and lit the 5 minute fuse. By this time the Germans seemed suddenly to realise what was intended and opened up a murderous fire on the skiff. Two of the crew were hit and Sandford, at the tiller, was hit twice. Stemming the current, they had only gone a short distance, when there was a tremendous explosion. Debris, falling all around them, miraculously missed the little boat. The crew of six were eventually picked up by Lt Cdr F H Sandford RN (elder brother of Lt Sandford) in a rescue picket boat. Each of the four ratings were decorated with the C.G.M., Lt Howell-Price RN received the D.S.O, and Lt Sandford RN was awarded the Victoria Cross. 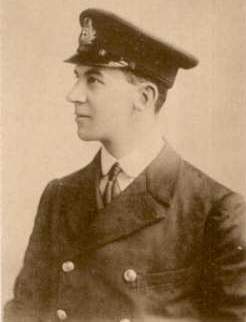 Lt Sandford was 27 years old and had joined the Navy as a cadet In 1904. He volunteered for service In submarines ten years later and had been in "The Trade" for the whole of the war. A cheerful, faithful and courageous man, his miraculous good fortune of St. George's Day seemed to desert him when on the 23 November 1918, twelve days after the armistice had been signed, he died - a victim not of the enemy but of typhoid fever. His Majesty the King has been graciously pleased to approve of the grant of the Victoria Cross to Lieutenant Richard Douglas Sandford, Royal Navy, for most conspicuous gallantry. This officer was in command of Submarine C-3, and most skilfully placed that vessel in between the piles of the viaduct before lighting his fuse and abandoning her. He eagerly undertook this hazardous enterprise, although well aware (as were all his crew) that if the means of rescue failed and he or any of his crew were in the water at the moment of the explosion, they could be killed outright by the force of such explosion. Yet Lieutenant Sandford disdained to use the gyro steering which would have enabled him and his crew to abandon the submarine at a safe distance, and preferred to make sure, as far as was humanly possible, of the accomplishment of his duty.